Anna Eleanor Roosevelt was born in New York City on October 11, 1884. Orphaned by the time she was ten, the young niece of President Theodore Roosevelt was raised by her grandmother. After attending finishing school in England, she returned to America and began visiting needy children in poor neighborhoods initiating lifelong work on behalf of the underprivileged. In 1905, Roosevelt married distant cousin Franklin D. Roosevelt. Over the next ten years she had six children one of whom died in infancy. Although her duties as mother and wife took most of her time, Eleanor Roosevelt continued to volunteer for good causes. While her husband served in Washington as Assistant Secretary of the Navy during World War I, she worked with the Red Cross and visited wounded troops in the Naval Hospital. Upon returning to New York City in 1920, Mrs. Roosevelt involved herself for the first time in the women's rights movement. In 1921, Franklin Roosevelt contracted poliomyelitis (polio) and was permanently paralyzed from the waist down. 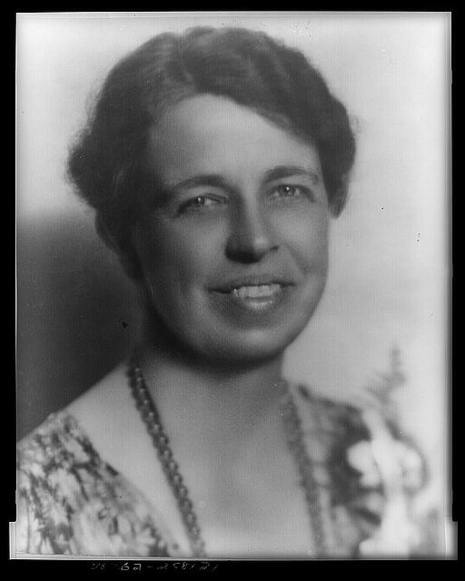 In order to maintain her husband's political career and to further her own ambitions, Eleanor Roosevelt significantly increased her political involvement. She participated in the League of Women Voters, joined the Women's Trade Union League, and worked for the Women's Division of the New York State Democratic Committee. In addition, she help found a non-profit furniture factory in Hyde Park, New York. During this period she began to act as her husband's "eyes and ears" traveling to places and talking to people her husband now found difficult to reach. Active in politics for the rest of her life, Roosevelt chaired the John F. Kennedy administration's ground-breaking committee which helped start second-wave feminism, the Presidential Commission on the Status of Women. She was one of the most admired people of the 20th century, according to Gallup's List of Widely Admired People.